20 Gloucester is located on the NW corner of Commonwealth and Gloucester, with 14 Gloucester to the north, across Alley 428, 284 Commonwealth to the south, across Commonwealth, 17 Gloucester to the east, across Gloucester, and 283 Commonwealth to the west. 20 Gloucester (281 Commonwealth) was designed by Peabody and Stearns, architects and built in 1886-1887 by Woodbury & Leighton, builders, for Charles Francis Adams, Jr., and his wife, Mary Hone (Ogden) Adams. Mary Adams is shown as the owner on the original building permit application, dated February 15, 1886. Mary Adams purchased the land for the house on April 25, 1885, from a trust established under the will of William Powell Mason for the benefit of his daughter, Elizabeth Rogers (Mason) Cabot, the wife of William Channing Cabot. The lot was the eastern 32 feet of a 190 foot parcel that real estate dealer Henry Whitwell had purchased on April 1, 1872, from a real estate investment trust formed by Grenville Temple Winthrop Braman, Henry Dwight Hyde, and Frank William Andrews. The parcel was part of one of four tracts of land purchased by the trust on March 1, 1872, from the Boston Water Power Company. Click here for an index to the deeds for 20 Gloucester. By the 1887-1888 winter season, Charles Francis Adams and Mary Adams had made 20 Gloucester their home. During the previous season, they had lived at 261 Clarendon. They also maintained a home in Quincy and then in South Lincoln. Charles Francis Adams was an attorney and served as president of the Union Pacific Railroad from 1884 to 1890. In 1892, he was appointed a member and served as chairman of the advisory committee that planned the Metropolitan Park System, and a year later he was appointed chairman of the permanent commission. He also was an historian and prolific writer on both historical topics and current issues. The Adamses continued to live at 20 Gloucester during the 1895-1896 season. On September 28, 1896, 20 Gloucester was purchased from Charles Francis Adams by Washington Butcher Thomas. He and his wife, Caroline (Wadleigh) Thomas, made it their home. They previously had lived at 285 Commonwealth. The October 1, 1896, Boston Globe article on the sale of 20 Gloucester noted that Charles Francis Adams sold the house “for the purpose of erecting for himself a handsome new house on land owned by the Riverbank company on Commonwealth av, just beyond the ‘three roads,’ as the former dwelling was not suited to his present needs.” The article continues to note that the new house will be “planned to give him the large library accommodations and other things which Mr. Adams is desirous of obtaining.” The Riverbank Improvement Company was developing the land on the north side of Commonwealth and on Bay State Road between Deerfield and Sherborn Streets. Charles Francis Adams was an organizing director of the company. It appears that he did not build this new house, inasmuch as, from 1897, he only listed his residence in South Lincoln in the City Directories. Washington Thomas was an executive of the Standard Sugar Refinery, owned by his father, Joseph B. Thomas, and later would become president of the American Sugar Refining Company. 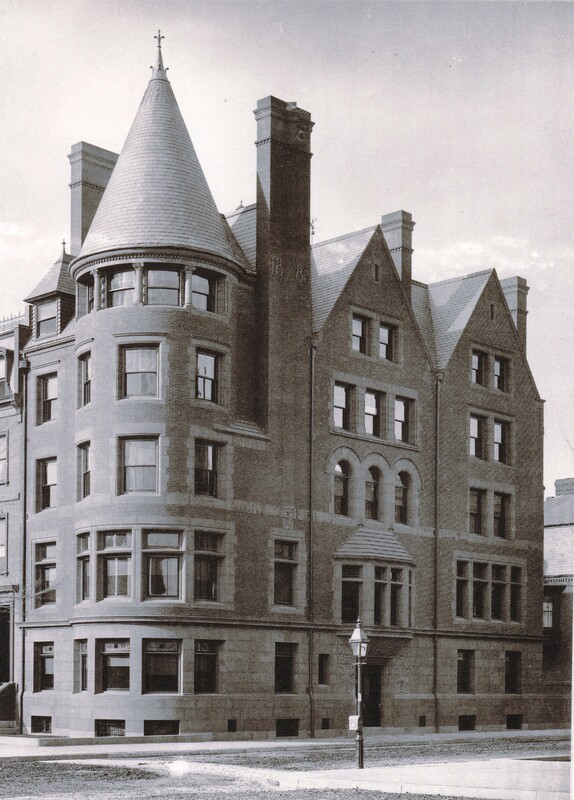 A major investor in real estate, in 1895, he built The Marlborough apartment house at 416 Marlborough, and in 1898-1899, he built the Hotel Cambridge at 483-485 Beacon. 20 Gloucester remained William and Caroline Thomas’s home for the rest of their lives. They also maintained a home, Netherfield, in Prides Crossing. During the 1900-1901 winter season, the Thomases lived elsewhere and 20 Gloucester was the home of rubber manufacturer Robert Dawson Evans and his wife, Maria Antoinette (Hunt) Evans. They previously had lived at The Westminster (southeast corner of St. James and Trinity Place). In May of 1901, they purchased to 17 Gloucester, across the street. They moved temporarily to The Empire at 333 Commonwealth while 17 Gloucester was being remodeled, and then to their new home. The Thomases resumed living at 20 Gloucester during the 1901-1902 season. During the 1909-1910 winter season, the Thomases were once again living elsewhere and 20 Gloucester was the home of Walter Denis Denègre and his wife, Bertha (Cobb) Armour Denègre. He was an attorney in New Orleans, where they maintained their primary residence; they also maintained a home in Manchester, Massachusetts. Walter Denègre had been a classmate of William Thomas at Harvard. 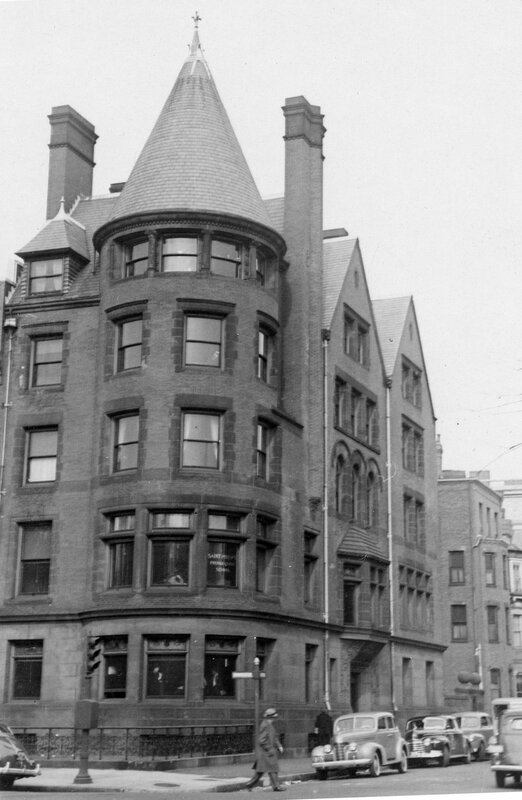 By the 1910-1911 season, the Thomases were once again living at 20 Gloucester. During the 1919-1920 and 1920-1921 winter seasons, the Thomases were joined at 20 Gloucester by their son-in-law and daughter, Samuel Dennis Warren, III, and Helen (Thomas) Warren, and their three children: Helen Warren, Anne Warren, and Samuel Dennis Warren, IV. Samuel Warren, III, was a paper manufacturer in his family’s firm. 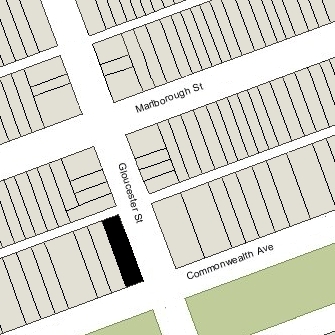 They previously had lived at 282 Marlborough, and had resumed living there by the 1921-1922 season. Washington Thomas died in May of 1929. 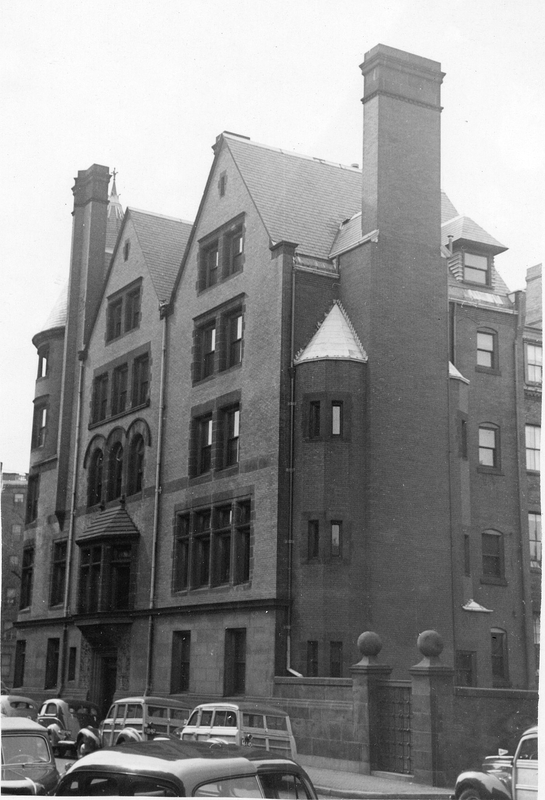 Caroline Thomas continued to live at 20 Gloucester until her death in May of 1939. From about 1936, she was joined there by Miss Helen S. Neil. 20 Gloucester was shown as vacant in the 1940 City Directory. On April 30, 1940, 20 Gloucester was purchased by St. Philip’s Preparatory School. It continued to be located there until about 1945. On January 22, 1945, 20 Gloucester was acquired from St. Philip’s Preparatory School by the A. N. C. Realty Company (Christos K. Patsades, treasurer). On September 5, 1945, 20 Gloucester was acquired from A. N. C. Realty by Thomas M. McDonald and his wife, Christine (Anderson) McDonald. They lived in Canton, Ohio, where he was president of the Weber Dental Manufacturing Company. In October of 1945, the McDonalds filed for (and subsequently received) permission to convert the property from a single-family dwelling into eight doctor’s offices. In July of 1946, they amended their application to add an owner’s suite along with the doctor’s offices, and by 1947, the McDonalds were living at 20 Gloucester. On February 15, 1950, 20 Gloucester was acquired from the McDonalds by Christ E. Ellis and Thomas Constantin. On May 8, 1950, Thomas Constantin transferred his interest in the property to Christ Ellis, and on May 8, 1950, he transferred the property to himself and his wife, Madeline (Theodore) Ellis. Christ Ellis later was Priest at St. George Albanian Orthodox Cathedral in South Boston. The Ellises lived at 20 Gloucester until about 1953, when they moved to Brighton. The property changed hands and on February 25, 1955, was acquired by Mildred F. Cox and Franklin Dexter, trustees of the Fulmo Real Estate Trust. In November of 1959, Hunneman & Company, as agents for the owner, filed for (and subsequently received) permission to convert the property into eight apartments and one doctor’s office. On April 18, 1969, 20 Gloucester was acquired from Mildred Cox and Franklin Dexter by real estate developer Edward L. Britt, trustee of the Twenty Gloucester Street Trust. On November 24, 1969, he converted the property into eight condominium units, the Twenty Gloucester Condominium. 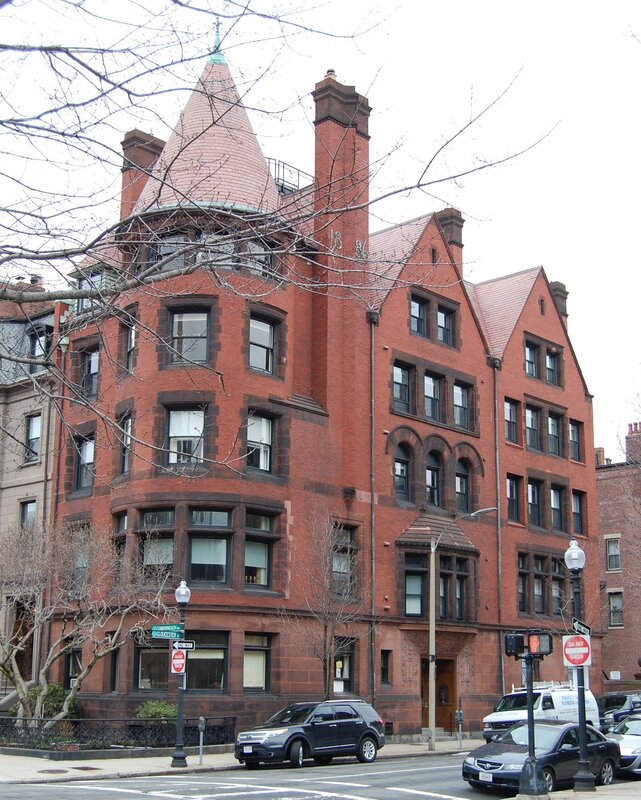 20 Gloucester was the first residential building in Boston to be converted into condominiums.